In addition to being tall and fair, the girl must be incredibly proficient in the kitchen. “You’ve completed your O and A’ Levels. You got amazing grades and A’ Level is a great accomplishment. It’s time you get married now,” said my mother, on several occasions. Yes, that time was here. I was being badgered into getting married. The sad part about being educated is that you can tell when a person is annoyingly dim-witted. On the one hand, the aunties gushed about my intelligence, which according to my mother was one of the most dominant factors propelling them to propose for me in the first place, while on the other, they also want my intellect to go to complete waste. After all, an ideal wife/daughter-in-law is supposed to be meek and obedient, have no individual voice of her own, be someone who adheres to blind conformism, is sweet to everyone, wouldn’t dare to think of going against the wishes of her in-laws or husband and is just an angel in every form; like a blob of play-dough that can be moulded every which way. Of course, the intelligence and educational background in this case has no bearing on their decision. Due to factors such as these, marriage, to me, became a revolting prospect. 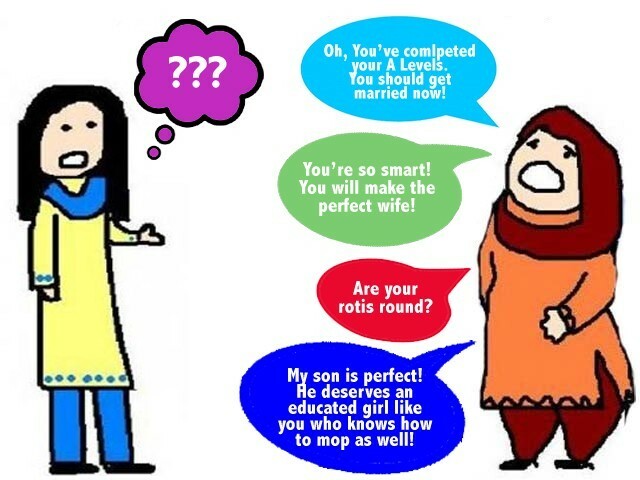 The whole idea of in-laws who expect their prospective daughters-in-law to be educated from the best institutions of Pakistan, and yet, demand they give it all up after marriage and act the part of the impeccable housewife just made no sense to me. I fail to understand the logic behind something like this. The fact that female doctors are ‘in demand’ on the list of these rishta-seeking aunties is appalling because they study and work hard to get through med-school, only for their career prospects to be thrown under the bus called marriage? Why go through the hassle in the first place? Did I want to start living a life like that at 19? Start a married life, or in more appropriate words, start a string of complications? Any sane girl’s answer would be a vehement no. And I’m sane, thank you very much. The idea that a large part of the Pakistani society supports this is ridiculous. Like I said, being educated does have its downfall – you can spot the fool faster than one who is not educated, and that can lead to disastrous situations. There have been times when I have had to refrain from doubling-up and laughing out loud at how boastful these ladies can be and the ludicrous demands they make as a result. I realise that a mother’s love for her child is blind, but for these women to come and flaunt their sons, as if they have been bestowed upon this very earth as some sort of divine being, while at the same time disregarding the girl completely is nonsensical in the least. It is like these ladies need a platform to confess their love for their sons and they choose to do so at a girl’s house. In my opinion, this is not done to choose a girl; this is done so that ‘eligible candidates’ can apply for the prestigious position of being his wife. It is like a job interview – and I thought that a girl’s father was supposed to do that. Here in Pakistan, however, the mother’s of the boys take up that role. When the time comes, they set off on mission impossible, choosing, from the shortlisted candidates of course, for girls with the same level of ‘perfection’ as their darling son. In addition to being tall and fair, the girl must be incredibly proficient in the kitchen. She should be able to cook, clean and mop with the efficiency of someone who does it on a daily basis; all with a big smile on her face. She must also dress elegantly and talk in a manner reflective of her education; not that her education is needed for anything beyond that. The educational achievements are, however, to be bragged about by the saasu ma. She does this whilst being comfortably seated in her drawing room surrounded by her friends, who are being served tea by her oh-so-accomplished bahu-rani. She takes pride in her doctor bahu who recently completed her MBBS from Dow Medical College (DMC), and is now a literate housewife to her son. Who cares if the said bahu utilised a substantial amount of government funding in the process? Funds roughly amounting to Rs1,000,000, I might add. All this money for a degree that now proudly rests in the bahu’s cupboard, eventually falling victim to time and dust – another casualty. The madness is so compelling; it still takes me by surprise as to why people don’t realise that there’s a need to step away from the traditions built long ago by women of the pre-partition subcontinent. In those times, our women lived in a confined, restricted world, with no exposure even to the village a few miles away, let alone international cultures across oceans. We need to break the shackles that hold us immobile and stranded in a swamp of absurd values and norms. What is wrong with letting a woman use her degree in a productive manner? There are enormous expenditures the government invests in, in order to have students educated at the University of Engineering and Technology (NED), Dow University of Health Sciences (DUHS), Sindh Medical College (SMC), Karachi Medical and Dental College (KMDC), Karachi University (KU) and other government-owned universities. Why should she not be obliged to return to society what she took from it? Is it really that offensive for a woman to be married and working? And, if the idea really is so unbearable, why in the world do aunties desperately seek out the girls with the most impressive resumes? We have realised over years and years of this topic being spoken about and written about that the aunties don’t seem to care – then is it not the responsibility of the girl to stand up for herself? Why didn’t you stand up? Why are you taking part in an archaic culture that holds no relevance in this day and age? It is with a heavy heart that I am forced to admit that rishta aunties are not the only ones to be blamed. It is the fault of our educated young girls too, girls like you and me… and that is the saddest part. A BBA student at IBA. She tweets as @PirzadaSara (twitter.com/PirzadaSara). Education is important for reasons you have mentioned. I want to point out that this is the culture in Pakistan. Women and men both know what is expected from them in our culture. You cannot fight it without collateral damage. You cannot fight it without hurting people. You cannot change it without making noise, a noise in a society which silences voices. Ms Sara – there is no such thing as “one of the top Ivy League universities in Pakistan”. From Wikipedia: The Ivy League is a collegiate athletic conference comprising sports teams from eight private institutions of higher education in the Northeastern United States. The conference name is also commonly used to refer to those eight schools as a group. The eight institutions are Brown University, Columbia University, Cornell University, Dartmouth College, Harvard University, Princeton University, the University of Pennsylvania, and Yale University. Hello author, I can absolutely relate to your story, however, I would suggest you and all the young girls like you not to blame aunties for it. If you are strong within, no one will or can treat a young girl like this. The thing is, our girls; and their parents give in too easily to these rishta demands. I was very lucky to have parents who stood up for me at every stage, they gave me courage and they made it very clear to every rishta that me, having earned a professional degree, would not stay at home. I shall have all the authority to make decisions of my own at every stage of life, whether it be to work or stay at home, the decision should be mine. Regardless the fact how desperate my parents were to get me married (like every other parent), they refused many proposals due to their unreasonable demand of “larki job nahi karaygi”. And this was the courage that led to me enroll in MBA from the same university you are studying, after I got married and became a mom. Most of such articles do not highlight the role of men in the society. Boys, please open your minds. Just how you want to take some decisions, have plans, think of the future, girls go through the same process. Tell your mothers to be patient and understanding. Ivy league uinv of Pakistan? Seriously? that makes no sense. Neither Oxford and Cambridge in UK nor Stanford in US nor IITs and IIMs in India describe themselves as Ivy Leagues. You aren’t quite able to understand the article in context of that view. The article is oddly written, I will admit, but her point is worth noting. I had a cousin in Pakistan who was doing amazing at university but was asked to leave her programme to get married to “the best shot she had”. Who, by the way, divorced her a few months later for losing her baby.